After a trip to Punta Cana, I was inspired to modify my favorite waffle recipe by substituting coconut milk for the milk and coconut extract for the vanilla. It added a subtle flavoring without altering the texture of the recipe. I love making this for overnight house guests and serving it with tropical fruit sprinkled with shredded coconut for a breakfast outside in the summer. It is very easy, delicious and gets rave reviews everytime. It would make a perfect Mother’s Day breakfast! 1- Combine all dry ingredients. 2- Mix together eggs, milk, butter and extract. 3- Incorporate the dry ingredients to the egg mixture. 4- Laddle onto a hot waffle iron until puffed up and golden. 5- Serve with fresh fruit and sprinkle shredded coconut on top. I used mango, peach, blueberry, blackberry and kiwi. Serve maple syrup on the side. 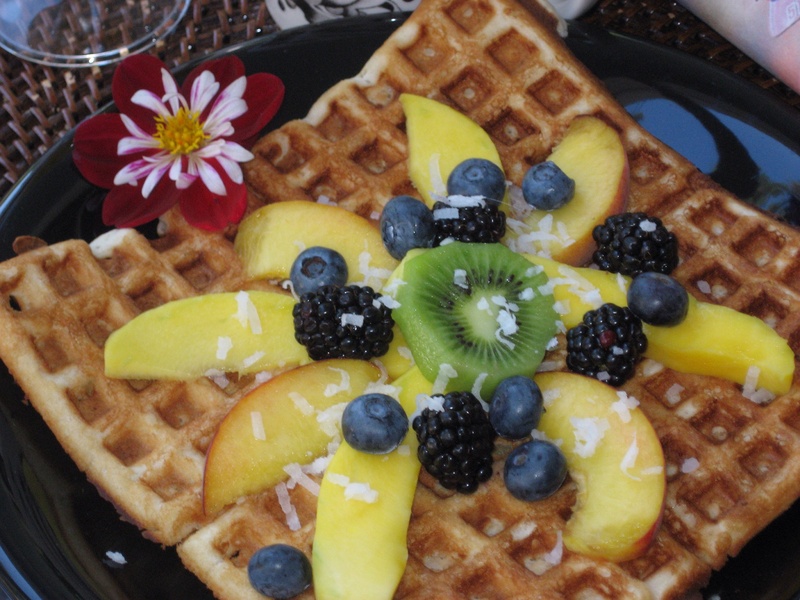 This entry was posted in Entertaining, Recipes and tagged breakfast on the front porch, Coconut waffles, Mother's day breakfast, summer breakfast, tropical fruit by Johanne Lamarche. Bookmark the permalink. just dawned on me, you should have a bed & breakfast! I want to acknowledge how much I like your black wicker with the black & white striped cushion. Very chic! 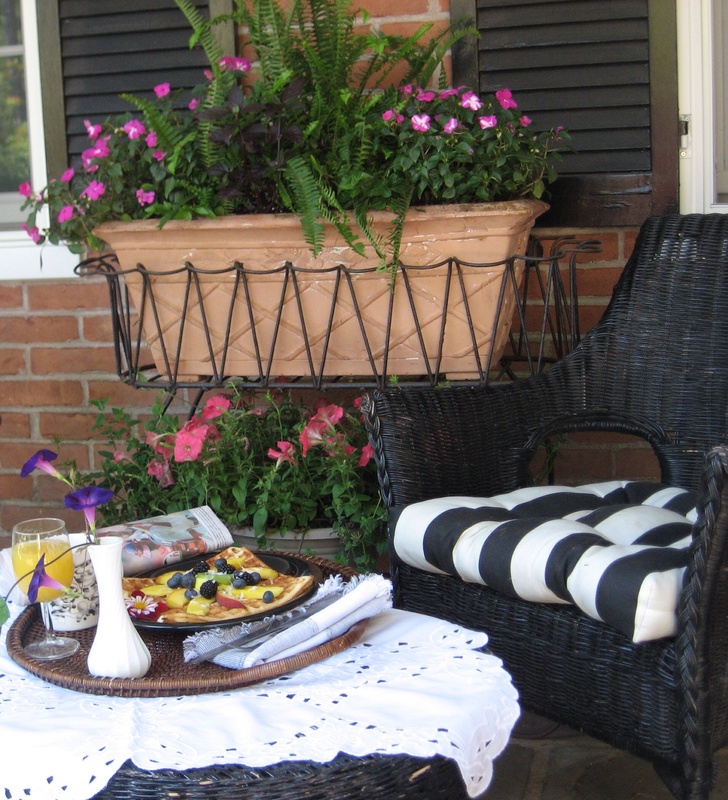 That black wicker with black and white cushions would look great with your cherry table setting! Very FRENCH, I think! :)))) If you love coconut and waffles, this will be a dish made in heaven! I doubt you throw anything together Alycia! Happy Mother’s Day weekend to you. Hope the extreme weather in KC has passed.